Thickness: 2mm. This table cover can be cutted to fit your table, you can mark with a pencil the exact measurement and use a sharp knife or scissors to cut. We will cut slightly bigger than actual size to avoid short after shrink in future. Perfect for kitchens, dining rooms, office workspaces and writing tables & desks. The clear protector is a bit sticky at the surface, NOT recommend to place on lacquered or polished NEW wooden tops directly because the damp painting may stick to the cover. 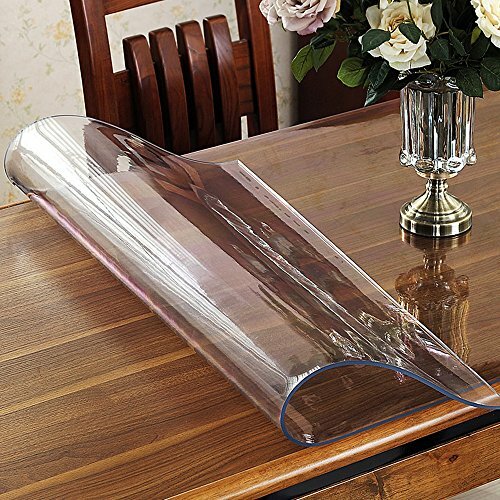 Also NOT recommend to place the item on stoving varnished, marble or glass tops because it will create air bubbles. Please use Frosted cover to instead.